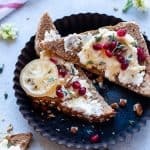 Light & Easy Ricotta Toast topped with pomegranate arils, fresh thyme, candied pecans and honey. The perfect quick sweet savory breakfast or appetizer recipe for the holidays! To the whole grain toast, smear ricotta from end to end. Top with pomegranate arils, fresh thyme, crushed candied pecans and drizzle with honey.